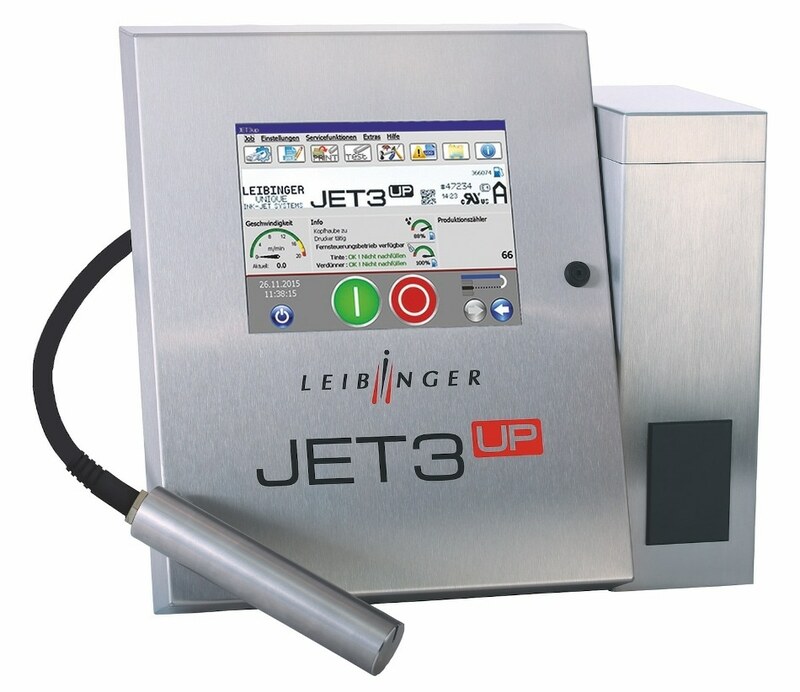 At the Motek 2018 trade fair in Stuttgart (Hall 8, Stand 8115), Paul Leibinger GmbH & Co. KG is presenting an inkjet printer for industrial product marking that only consumes 20 watts of power: the JET3up. In fact, the printer consumes less energy than most light bulbs and is significantly more economical than many other printing systems. Leibinger has also integrated a recycling system that reduces solvent consumption by 50%. The days of cheap electricity are over for the industrial sector. Prices have been steadily rising since 2016 and are becoming a burden on German industry. So, of course, companies are trying to save energy costs wherever they can. And electricity savings can not only be achieved on large machines and systems, but also on smaller devices such as lamps, fans and printers. This is now being proven by the Paul Leibinger GmbH, a Baden-Württemberg-based manufacturer of continuous inkjet (CIJ) printers that mark products with information such as batch numbers, best-before dates and 2D codes. “Through continuous research, we have succeeded in increasing our printers’ energy efficiency so that they consume only 20 watts – less than most light bulbs,” explains Christina Leibinger, Managing Proprietor of Paul Leibinger GmbH. The designers have used ingenious power-saving tricks such as energy-saving electronics and a design that eliminates the need for internal fans. In order to protect both people and the environment, Leibinger also endeavours to further reduce the consumption of solvents. “A major step in this direction has been achieved with the development of the EcoSolv recycling system,” explains Leibinger. EcoSolv is integrated to the printer housing. The system condenses evaporated solvent from the printer exhaust air and returns it to the storage tank. Consumption can therefore be reduced by up to 50 percent. This results in less volatile organic substances, less packaging waste and reduced consumables costs. The EcoSolv recycling system is an optional feature for all Leibinger’s new CIJ models. And older models can be retrofitted. The retrofit kit contains the pre-assembled recovery system, which can be integrated into the devices with little effort. As an all-rounder, the system is compatible with all common dye-based standard inks. The CIJ printers from Tuttlingen are used worldwide for marking products and packaging. In the consumer goods industry, for example, they mark shampoo bottles, in the beverage industry cans and in the automotive sector parts made of metal, plastic and carbon. And they do not even have to touch the product. The drops of ink fly out of the print head, land on the surface as pixels, and dry within a second. At the Motek 2018, between October 8 and 11, Leibinger is presenting the JET One model from the Entry Line, the JET2neo from the Basic Line, the JET3up from the Universal Line and the JET Rapid from the High Speed ​​Line (Hall 8, Stand 8115).